You thought your grandmother was cool? 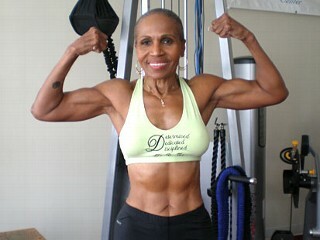 Meet Ernestine Shepherd, a 75-year-old grandma with a passion for crunching iron. What’s most interesting about Ms. Shepherd is, she didn’t particularly pay much attention to fitness in her youth. She only started working out in her fifties, after which she dropped it and then decided to start again in her 70s. She is currently the oldest competitive female body-builder in the world. She is also a certified personal trainer. She joined competitive body-building with her sister Velvet in the late 1980s, but her sister died in 1992 from a brain aneurysm. She wakes up at 3 am and works out every day to keep her sister’s memory alive. Since the age of 56, she has won two body-building titles and run nine marathons.